We love REAL lemonade! No powder substitute for me. Please give me the real stuff! And if you are looking for an alternative to gatorade just add a little salt and some calcium powder and you can be refreshed with electrolytes without any corn syrup or other nasty chemicals! 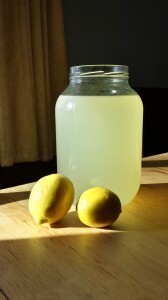 To make fresh lemonade you start by making a simple syrup. Basically dissolve equals parts of sugar and water. We do this one of two ways. You can put the sugar in a pan with the water on medium heat and stir until the sugar is dissolved or put the sugar in the bottom of your glass jar or pitcher and add hot water to it whisking it until it dissolves. 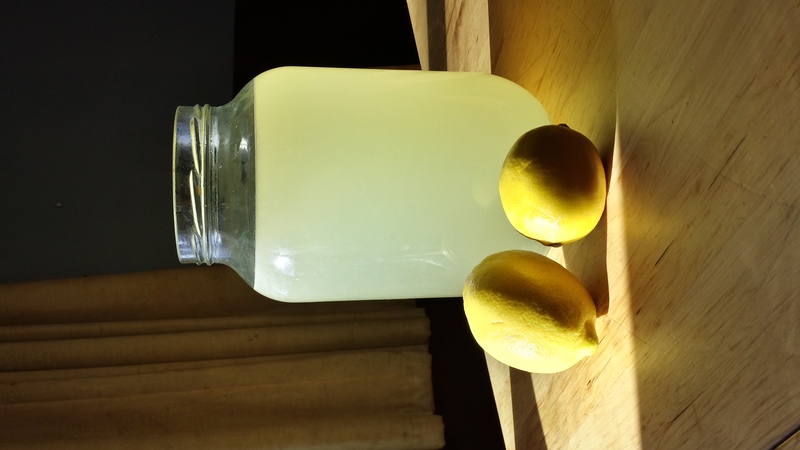 Then add your lemon juice and dilute with water to your desired tastes. We like a ratio of 1 part sugar, 1 part water, 1 part lemon juice and then dilute with 4 parts water. Dissolve 2 cups of sugar with 2 cups of water. Dilute with water until you achieve your perfect balance. Last weekend it was our turn to teach the Preschooler Bible Class. For one of our activities we made a figure 8 on the floor with tape to demonstrate the unendingness of God’s love. While the kids were coloring their activities sheets my husband thought 1potato should see how far she could jump on the figure 8. She made it about halfway. Another helper also tried and made it just slightly further. 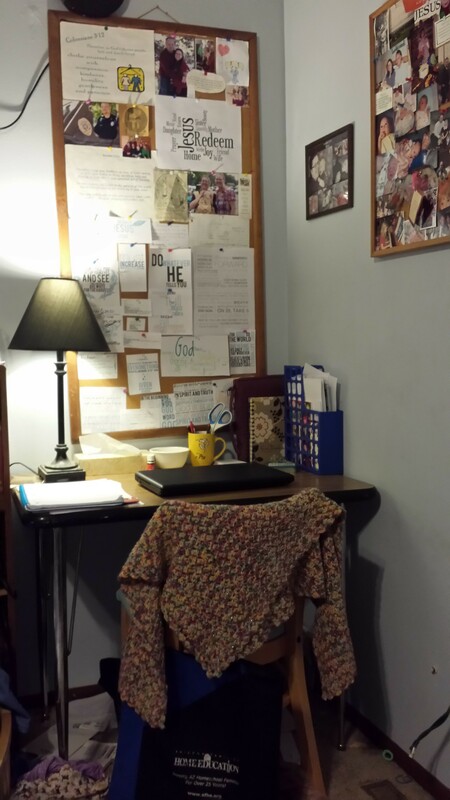 I reminisced about how my husband used to be able to jump very far in his youth. I encouraged him to demonstrate his abilities and he willingly did so jumping about 6 feet. Unfortunately, we both forgot that he was wearing steel-toed boots. He jammed his toe into the steel and pain shot through his foot. We were pretty sure he just sprained his toe. By the time we got home his big toe was very swollen and black and blue. I applied Arnica cream to it and he spent pretty much the rest of the day in bed in severe pain. He also took some ibuprofen which he never takes. The pain and swelling continued for the next couple of days and we applied more of the arnica cream each day. It seemed to be quickly going through the stages of healing but it was still difficult for him to put much weight on it. Thankfully he has a desk job so he was able to stay off of it for the most part. On Thursday I started worrying that maybe he actually broke his toe instead of just jamming it so I started to do some research. 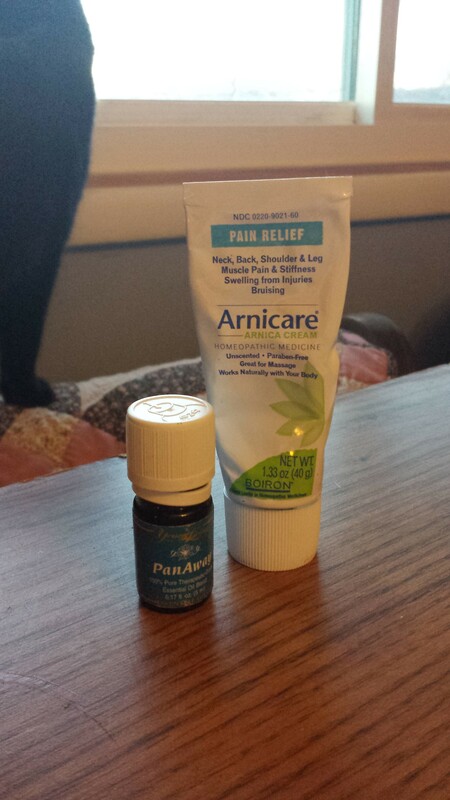 Sudddenly I remembered that PanAway oil from Young Living was used in treating such injuries. It is a combination of Wintergreen (Gaultheria procumbens), helichrysum (Helichrysum italicum), clove (Syzygium aromaticum) and peppermint (Mentha piperita). I felt so dumb for having not thought about that earlier in the week. When he got home I liberaly applied the PanAway to his toe and rubbed it in. Within a few minutes he was able to walk normally again! It is still sore but we have been applying the PanAway at least twice a day since. The swelling is almost all gone and his toe is flesh colored again. I love essential oils and how wonderfully they work! Now if I can just remember to use them right away! Oh how I have been enjoying Ann’s book. I’m trying really hard to savor it and apply it instead of reading hastily through it. I’m back on working daily on my list of gifts although I haven’t been posting them all here. 444. 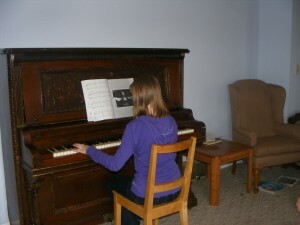 We have a piano once again! 450. Phone calls from my sister — any time of day. 451. Awesome friends — who even help move pianos! 452. Generous friends who gave us the piano.